This article is an analysis of the sixteen lands described in the first chapter of Vendidad, based on the additional information available in Vendidas as well as the various texts of Vedic tradition, such as the four Veda Samhitas, the Mahabharata and the Puranas. The table given below summarizes the analysis of the sixteen lands in the order it is mentioned in the first chapter of Vendidad . From this analysis, what is revealed is that the Ahuras / Asuras shared the territory with the Devas or Deva-worshiping tribes in India, sometimes coexisting with them and often conflicting with them, in agreement with the evidence available from Rig Veda, the other three Vedas, the Mahabharata and the Puranas. The Asura / Ahura region extended from Kurukshetra (Hariyana) to westward including Sarasvati-Sindhu valleys and the many tributaries of Sarasvati and Sindhu. This territory includes western India and what is now Pakistan and Afganistan. From other place-names found in Vendidad and other Avestan text, we can also concluded that they later migrated to Iran and adjacent central Asian countries (Tajikistan, Uzbekistan and Turkmenistan) before all the texts of Avesta was fully completed. vdd.1.2:- The first of the good lands and countries which I, Ahura Mazda, created, was the Airyana Vaeja by the Vanguhi Daitya Thereupon came Angra Mainyu, who is all death, and he counter created the Serpent in the River and Winter, a work of the Daevas. vdd.1.3:- There are Ten Winter months there, Two Summer months and those are cold for the waters cold for the earth, cold for the trees Winter falls there, the worst of all Plagues. Airyana Vaeja is very important for the Ahuras and the inheritors their ideology viz. the Iranians, since the name Eran Vej is derived from it which later became the name 'Iran'. This region is described in Vendidad as the region near the Vanguhi (good) Daitya river. Climate is described as very cold; 10 month long winter and 2 month long summer in which water is still cold and temperature is still cold for vegetation. This cold climate makes the identification of Airyana Vaeja with Arya-varta (Indo-Gangatic plain) very difficult. The temperature is not that cold in Arya-varta. Fortunately piece of information that it was invaded by serpants (Nagas) (the Serpent in the River) allows us to identify it with the Airavata region, the regions north and north-west of the Iravati river. This region include the cold Himalayan territory, including the Kashmir valley, Swat valley, northern most regions of Pakistan and north-eastern Afganistan. Here winters are extremely cold and long but summers are short and without any heat. The serpent mentioned here is identifiable with the Airas or the Airavata Nagas, a snake worshiping tribe inhabiting in this same region. They had a stronghold at Uraga (to the west of Kashmir valley). The Daitya river is identifiable with Rig Vedic Asikni, which is same as the Chandrabhaga (Chenab) mentioned in Mahabharata. It could also be the Vitasta (Jehlum) river to the north of Chandrabhaga or the Iravati to its south. The serpent in the river could also be the frost or glacial ice sheets that sweep through the river as its water freeze due to winter. The name Airyana Vaeja is often wrongly identified with Aryan homeland and with Arya-varta (Indo-Gangatic plain), but more accurately it is identifiable with Aira Vata (Airavata). Vaeja means, 'territory', 'homeland' etc. Vata too means 'territory' 'homeland' etc. vdd.1.4:- The second of the good lands and countries which I, Ahura Mazda, created, was the plain which the Sughdhas inhabit. Thereupon came Angra Mainyu, who is all death, and he counter created the locust which brings death unto Cattle and plants. The north of Kurukshetra is described in Mahabharata as a fertile land, untouched by the aridity that existed in the south of Kurukshetra. Mahabharata describe this region as Sumandala meaning 'good region'. Sughdha could also mean 'good terrain' (Sukha-dhara) or 'a terrain good for comfortable living'. Sughdha is thus identified with this Sumandala. This region now lies in southern Punjab which is even today a fertile land and a heavily cultivated land. This fertile strip of land stretches from the foothills of Himalayas to westwards. The name Sughdha survives here as Srughna and Sugh. Cattle and plants here are sometimes infested with locusts (the swarming stage of a variety of grasshoppers and other pests). vdd.1.5:- The third of the good lands and countries which I, Ahura Mazda, created, was the strong, holy Mouru. Thereupon came Angra Mainyu, who is all death, and he counter created Plunder and Sin. West of Kurukshetra is Maru, the desert land, which extend southwards (as what is now known as the Thar desert). Mouru is identified with this Maru. The formation of this Maru and the drying up of Sarasvati river were the result of the same climatic and tectonic changes that occurred in this region before Kurukshetra War, but after the earliest formative periods of Rig Veda. This Maru region also came to be known as Marvad and many historical kingdoms arose in this region with the same name. Like in any desert country, water and other resources are very rare in Maru and people fight for them, giving rise to plunder and sin. vdd.1.6:- The fourth of the good lands and countries which I, Ahura Mazda, created, was the beautiful Bakhdhi with high lifted banner. Thereupon came Angra Mainyu, who is all death, and he counter created the Ants and the ant hills. Bakdhi is identified with Bahli or Bahlika. The descriptions in Mahabharata make it identifiable with western Punjab (of India). This place is beautiful with its fields often infested with ants and ant-hills. During Kurukshetra war, Kuru-Bahlikas ruled this place, who were allies and kins of the Kurus at Kurukshetra. vdd.1.7:- The fifth of the good lands and countries which I, Ahura Mazda, created, was Nisaya that lies between the Mouru and Bakhdhi. Thereupon came Angra Mainyu, who is all death, and he counter created the Sin of Unbelief. Nisaya as per Vendidad lies between the Mouru and Bakhdhi and it was later inhabited by non belivers (non Ahura people). The place named Vinasana described in Mahabharata fits the description. It lies between Maru and Bahlika. Vinasana is the place where Sarasvati river dried up first, due to the tectonic activities of the region. Non Vedic (and probably non Ahura) tribes lived here including the Sudras and Abhiras. Nisaya could be a corruption of 'Naasana', the (place of ) destruction (of Sarasvati). vdd.1.8:- The sixth of the good lands and countries which I, Ahura Mazda, created, was the house deserting Haroyu. Thereupon came Angra Mainyu, who is all death, and he counter created Tears and wailing. Haroyu is the Avestan distortion of the Vedic-Sanskrit name 'Sarayu'. The land of Haroyu is described as a region where people go deserting their houses. People there is mentioned as full of tears and wailing. The description fits with the western Sarayu river, which was a western tributary of Sarasvati that dried up along with some parts of the Sarasvati river. People often desert their houses when the river that provide them sustenance dry up. Subsequently the river name Sarayu was applied to rivers in east and west of Sarasvati. An eastern river with the name Sarayu was the river that flows through Ayodhya. The Hari river in the west flowing through Herat in Afganistan too got the name Haroyu / Sarayu. vdd.1.9:- The seventh of the good lands and countries which I, Ahura Mazda, created, was Vaekereta of the evil shadows. Thereupon came Angra Mainyu, who is all death, and he counter created the Pairika Knathaiti who claves unto Keresaspa. This region is described as having the evil shadows. It was inhabitted by the Pairika Knathaiti who claves unto Keresaspa, i.e rides on Keresaspa, which is an Avestan corruption of Vedic-Sanskrit ' Krisaashva' (Krsa-ashva meaning lean horses). Vaekereta could be an Avestan corruption of Vaaji-ratha (horse driven chariot) or Vaaji-rashtra (the land of horses). The land of horses was also known as Ashvaka and its people were known as Ashva-ganas. The territory of the Ashva-ganas was called Ashva-gana-stana from which is derived the name Af-gani-stan or Afganistan. Thus Vaekereta is identified with Afganistan especially with the Kabul region. vdd.1.10:- The eighth of the good lands and countries which I, Ahura Mazda, created, was Urva of the rich pastures. Thereupon came Angra Mainyu, who is all death, and he counter created the Sin of Pride. Urva region is described as having rich pastures (Urvaras), however its people later became filled with pride (probably they disregarded Ahura religion). The regions described in the Vedas as Sushoma and in Mahabharata as Suhoma matches with the description. It seems to be the native place of the Apsara Urvasi. This region lied to the west of Uraga (Khnenta) in what is now northern Pakistan. vdd.1.11:- The ninth of the good lands and countries which I, Ahura Mazda, created, was Khnenta which the Vehrkanas inhabit. Thereupon came Angra Mainyu, who is all death, and he counter created a Sin for which there is no atonement, the unnatural Sin. This region is described as inhabited by Vehrkanas who later became unnatural sinners (non Ahuras). The name Khnenta is difficult to identify but the name Vehrkanas corresponds to Uhrakanas or Uragas, a Naga tribe (snake worshiping tribe) mentioned as living to the west of Kashmir valley. vdd.1.12:- The tenth of the good lands and countries which I, Ahura Mazda, created, was the beautiful Harahvaiti Thereupon came Angra Mainyu, who is all death, and he counter created a Sin for which there is no atonement, the burying of the dead. Harahvaitis the Avestan distortion of the Vedic-Sanskrit name 'Sarasvati'. Harahvaiti region is described as beautiful. It is mentioned as being inhabited by non-Ahura people who bury dead. The region is identified with both western shore line of Sarasvati river. Many non Vedic (and non Ahura) tribes like Sudras who lived on the banks of Sarasvati buried their dead as part of their traditions. vdd.1.13:- The eleventh of the good lands and countries which I, Ahura Mazda, created, was the bright, glorious Haetumant Thereupon came Angra Mainyu, who is all death, and he counter created the evil work of Witchcraft. vdd.1.14:- And this is the sign by which it is known, this is that by which it is seen at once: wheresoever they may go and raise a cry of Sorcery, there the worst works of Witchcraft go forth. From there they come to kill and strike at heart, and they bring locusts as many as they want. Heatumant is described as bright and glorious which later got inhabited by people who do witchcraft and sorcery. The problem of locusts (pests) infesting cultivation and cattle is described here as well. This make it similar to the Sugdha region. The Kekaya territories that lied to the west of Kuru-Bahlika (western parts of Punjab, India), which lies in what is now Punjab of Pakistan, too was a fertile land, supporting rich farming and cultivation. It is still a highly cultivated land. The description of locusts fits well here. The mention of witchcraft and sorcery probably is a hostile comment of the Ahuras about this Vedic people. The Kekayas later migrated along Helmend river in Afganistan, to reach Caucasus. The name Caucasus is derived from Kekaya. vdd.1.15:- The twelfth of the good lands and countries which I, Ahura Mazda, created, was Ragha of the Three races Thereupon came Angra Mainyu, who is all death, and he counter created the Sin of utter Unbelief. Ragha seems to be a region in continuity with Rangha, to its south-west. It is mentioned as having people of three races (priests, wrriors, husbandmen) much like the Ahuras themselves. People here were mentioned as becoming non Ahura (non believers). In Zhob-Kulachi region of western Pakistan, there are several places with the name Ragha. This could be the region west of Sindhu (Indus). In Mahabharata this region was mentioned as part of the Sivi (Sibi) kingdom. Sivi region had the three Varnas:- Brahmana (priests), Kshatriya (warriors) and Vaisya (husbandman), who were later known to be foremost among Indra worshipers. A Sivi king is mentioned as one among the many Indras. Thus they were non believers (Indra-worshipers / Daeva worshipers) from the Ahura point of view. vdd.1.16:- The thirteenth of the good lands and countries which I, Ahura Mazda, created, was the strong, holy Chakhra Thereupon came Angra Mainyu, who is all death, and he counter created a Sin for which there is no atonement, the cooking of corpses. Chakhra is described in Vendidad as strong and holy. It is mentioned as being inhabited by people who cook (cremate) corpses. Chakhra is identified with Shamachakra the south-west corner of Kurukshetra. Cremating of corpses is a common practice here following the Vedic traditions. This was a holy place. Probably the dead bodies of warriors dead in numerous battles fought in Kurukshetra were cremated here. vdd.1.17:- The fourteenth of the good lands and countries which I, Ahura Mazda, created, was the Four cornered Varena for which was born Thraetaona, who smote Azi Dahaka. Thereupon came Angra Mainyu, who is all death, and he counter created abnormal issues in Women and barbarian oppression. Varena also known as Vara is described several times in Vendidad. It seems to be very important for the Ahurs, as they have high regard for this region. This region is described as rectangular with four corners, resembling the description of Kurukshetra in Mahabharata. Kurukshetra is described as a rectangular region. Tarantuka, Arantuka, Rama-Lake and Shama-Chakra are the four corners of Kurukshetra. Varena is mentioned as the birthplace of Thraetaona who defeated Azi Dahaka (Azi = Ahi / Naga; Azi Dahaka = the great Naga). Kurukshetra region had witnessed several abnormal births described in Mahabharata often associated with end of battles fought in Kurukshetra. Examples are the abnormal births of delivered by Gandhari and later Uttara. Kurukshetra also had suffered many barbarian oppression. Vara is also described as the place where Yima the son of Vivanghat (Yama, the son of Vivasvat) established himself after the Great Frost described in Chapter 2 of Vendidad. The territory of Yama is identified with the territory to the west of river Yamuna, which is same as Kurukshetra and Kurujangala. This was also the same territory ruled by king Yudhisthira, the Pandava, who is mythologically described as the son of Yama (probably since he ruled the same territory formerly ruled by Yama). Kurukshetra was formerly a fertile land, given to cultivation. The founder of Kuru dynasty, viz. king Kuru is mentioned as using this land as a field. Later, aridity in the west and south of Kurukshetra extended northwards and reduced Kurukshetra into an uncultivated plain, suitable for conducting large battles and laying out huge armies. There were several wars in this region, before and after the Kuru-Pandava war described in Mahabharata. vdd.1.18:- The fifteenth of the good lands and countries which I, Ahura Mazda, created, was the Hapta Hendu (Seven Rivers) Thereupon came Angra Mainyu, who is all death, and he counter created abnormal issues in Women, and excessive heat. Hapta-Hendu or Hapta-Hindu is easily identified with Sapta-Sindhu, the land of seven rivers that lies between rivers Sindhu and Sarasvati. The seven rivers include, Sindhu, Sarasvati and the tributaries of Sindhu (some of which were formerly tributaries of Sarasvati). This name is applied to the whole of Punjab, but is sometimes more precisely applied to the confluence of Satluj and Sindhu known as Panjnad (southern Punjab of Pakistan). Avesta mentions that this region became subject to excessive heat and abnormal births. Sindhu Sarasvati region is warm and extremely hot in summers especially in its south and in the regions where aridity increased due to the drying up of Sarasvati river. Abnormal births mentioned in this region could also be linked to the harshness of the climate at such places in this region. vdd.1.19:- The sixteenth of the good lands and countries which I, Ahura Mazda, created, was the land by the sources (?) of the Rangha where people live who have no chiefs Thereupon came Angra Mainyu, who is all death, and he counter created Winter a work of the Daevas. The land near the source of Rangha is described as inhabited by people with no chiefs. Such a territory is mentioned in Mahabharata. It is the region of Arattas, also known as Aratta-Vahikas, the people without kings or chiefs. They lived between the rivers Iravati (Raavi) and Chandrabhaga (Chenab) but also spread along all the rivers to its west. Aratta was also famous for its excellent horses. Aratta (Arashtra)-Bahlikas seems to have some kinship with the Madra-Kambojas or they could all be same people. Rangha could be one among the many rivers in this region. Climate of the region seems to be dominated by winter, indicating that the region is close to cold Himalayan regions like Kashmir. This also strengthen the identification of this region between Raavi and Chenab, which is close to Kashmir. A much severe winter is mentioned in Airyana Vaeja, which seems to lie adjacent to Rangha, and to its north. Positive comments are given more weight in the analysis (creative works of Ahura Mazda) than the negative comments (works of Angra Mainyu) which are taken if additional evidence is needed to confirm the identification of the location. From the analysis we get that the Ahura / Asura territories as described in the first chapter of Vendidad, lied predominantly in the north-western India and most parts of Pakistan. They extended further into Afganistan. In later periods of prehistory they might have spread westward into Iran and Azerbijan and northward into Tajikistan, Uzbekistan and Turkmensitan. 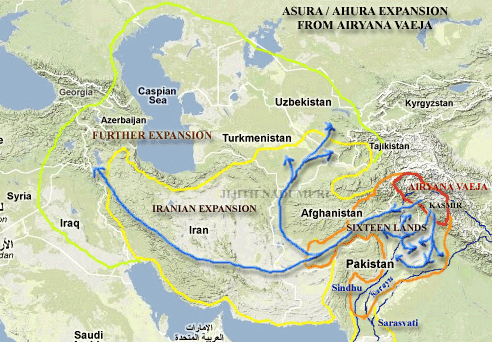 Etymologically, Azerbijan is Azer-bi-jan / Asurabhijana / Asura-abhi-jana, the country of Asuras or Ahura people. Azerbaijan could also be Atharva-jana, the country of the Atharvans. The Atharvans were Ahura priests. Sarasvati river of India was like an eastern boundary of the Ahura territories. The northern course of Sarasvati river in Kurukshetra seems to be a region of conflict between the Ahuras and the Deva worshipers. The Deva-Asura conflicts mentioned in the Mahabharata and the Puranas (and the / Daeva-Ahura conflicts mentioned in the Avestan texts like Vendidad) seems to have occurred at Kurukshetra and on the banks of Iravati (Parushni), Chandrabhaga (Asikni) and Vitasta, which might have lead to the dispersal of Asuras / Ahuras to western (Iran) and northern (Central Asian) countries. The sequence in which the sixteen lands are mentioned in Vendidad had puzzled researchers for more than a century. One of the earlier inference was that 1) the 15th (Hapta-Hindu = India(? ), excessive heat) and 16th (Rangha, winter) lands represents the eastern and western extend of Ahura lands, 2) the 1st land (Airyana Vaeja = Iran / Iraq (? ), severe winter) is close to the 16th land since both mention winter and that other lands (2 to 14 somehow lied in the middle of these extremes. 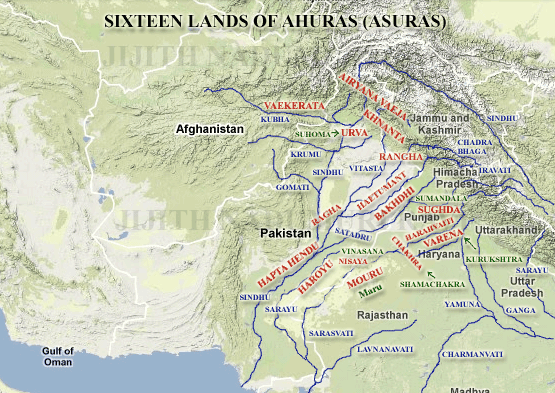 However our analysis reveals that the Ahura land was almost confined within the western mountains of Pakistan in the west and Saraswati and Kurukshetra in the east, with only a small territory spilling through Afganistan into further west. In the north was the Himalayas with its severe freezing winters and in the south is the hot desert (which has now grown to the Thar desert) .Thus all lands lied within these boundaries. This result is reinforced by the fact that all kinds of extreme climates (hot summers, sever winter, fertile lands, deserts, floods, aridity), flora and fauna (ants, ant-hills, locusts etc) exist within this region of the Indian Sub-continent. The sequence then seems to be the local and irregular migration paths taken by the Ahuras, within their larger geographical domain, who often encountered Deava worshiping tribes and had to change their course or retreat back to where they came from. The over all theme of the narration also support the view that the Ahuras suffered severe oppositions and set backs from the Daeva tribes which made them to move hither and thither. 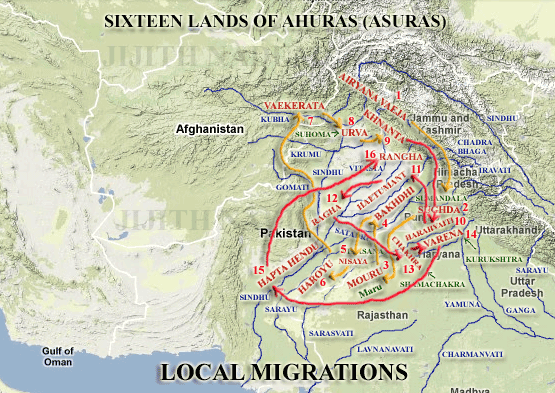 Local Migrations of Ahuras / Asuras in the sixteen lands. The migration sequence is numbered from 1 to 16. Older migrations (1 to 9) are colored with orange paths and later migrations (10 to 16) are colored with red paths, for clarity. The Asuras set forth from the Airyana Vaeja (Kashmir and Swat valleys with prolonged 10 month long winter). From there, due to severe winter and probably(?) due to the serpent worshiping tribes like Uragas, they went to the plains of Sughda in the south (Punjab). Their they tried to settle with their cattle and cultivation for some time. Daeva worshiping farmers could have infested their cattle and fields with locusts. Probably they tried migrate further south into Varena (Vara) / Kurukshetra (Vara Prithivya), which is the best place to live, but were made to flee by the Daevas to the desert country Mouru (Maru) in the west and south of Kurukshetra. There it seems their wealth was plundered. They might have tried to retreat back to Sughdha but were deflected to Bakhdhi (Bahli or Bahlika, literally to the outskirts), which lied to the western outskirts of Sugdha, not as good as Sugha plains but with many cultivable lands. Their lands were then infested with ants and ant-hills, which Ahuras attributed to be the work of Daeva worshipers. From there, they were forced to flee back to Mouru (Maru), but they stopped at Nisaya (Vinasana) which lies in between Bahlika and Maru and an entry point into the Maru (desert). From there they went to Haroyu (Sarayu) a western tributary of Sarasvati (or Sindhu), where houses were already deserted by its former inhabitents due to the drying up of the river. As it was impossible to stay along the dried up Haroyu for long, they went westwards to Vaekereta, the mountainous terrains of Afganistan centered around Kabul. There they faced opposition from the horse riding Ashvakas. They then went eastwards to the rich pastures of Urva (Sushoma / Suhoma) attacking the Daeva worshipers. However they were forced to flee northwards into the mountainous Khnenta, the territories of Uragas ,which was very uncomfortable for the Ahuras due to there bizarre religious practices. From there they went southwards to reach the banks of Harahvaiti (Sarasvati), probably a second attempt to reach Varena / Kurukshetra. However they had to retreat to Haetumant (Kekaya) which is again a cultivated land that lied to the west of Bakhdhi (Bahlika) and which had usual problems of locust infection. Apart from this there were people practicing witch-craft and sorcery, probably an allusion to people practicing (Indic) Atharva Vedic hymns of black magic and sorcery. From there the Ahuras went further west into Ragha (Sivi territories) full of people of three Varnas (much like the Ahura society, but who were Daeva worshippers). After gaining strength, the Ahuras then went north-eastwards, aiming at Varena / Kurukshetra (for the third time). This time they attacked from the south west as the other two attempts were to enter Kurukshetra from the north. They reached Chakhra (Shamachakra), the south-western corner of Kurukshetra. There they saw the disgusting act of corpse being cremated (cooked). They moved ahead to conquer Kurukshetra (Varena). There they defeated the Nagas with their king Azi Dahaka. However the Asuras were soon forced back by the Daeva worshipers south-westwards to Hapta-Hendu (southern Punjab of Pakistan or more precisely Panchnad at Indus-Satluj confluence). This region is much hotter compared to the original homeland (Airyana Vaeja / Kashmir-Swat valleys) of the Asuras. They migrated northward from there and reached the territory of Arattas in northern Punjab (Pakistan) between the rivers Iravati (Raavi) and Chandrabhaga (Chenab) and further north. This region is Rangha which is dominated by a winter climate but not as severe as Airyana Vaeja which lied adjacent in the north. The table shown below shows the five-fold classification of the sixteen lands based on their north-south geography. To the extreme north is Airyana Vaeja with its extreme winter climate, on the Himalayas as the first group. To the extreme south is hot and dry desert lands that includes Hapta Hendu, in and near the Thar desert, as the fifth group. The middle three groups (2,3,4) are not so distinct but follow a north south pattern. The second group is a cold region to the south of Himalayas, but not as cold as the Himalayas. The third and fourth group are cultivated lands. The third group containing Punjab is very good for cultivation. Punjab is even know well known for its agriculture potential. The fourth group is good for cultivation but known more for its religious significance, including Hariyana. This region contains the priced land Varena or Kurukshetra for which the Ahuras / Asuras fought many times (three times from our inferences).